Q. 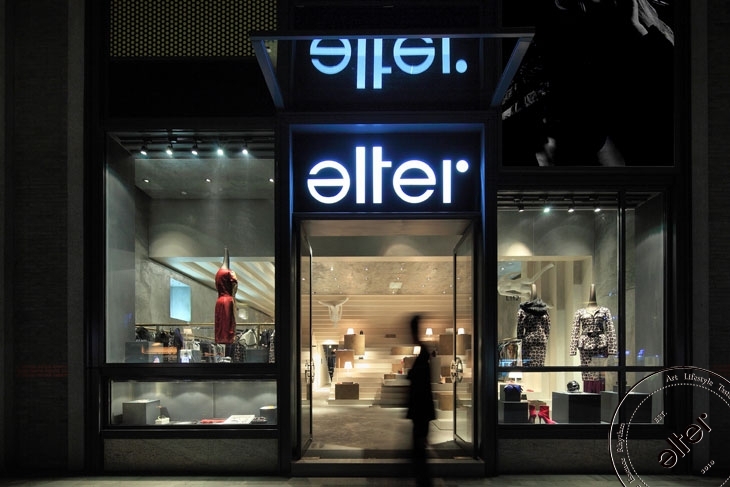 Can you tell us about the inspiration behind the interior of Alter. The philosophy of Alter, as the word say is to be and inspire an alternative world, so as a designer I imagined an alternative architectural space like the ones in the drawings of Escher, where gravity and the rules of the normal world doesn’t exist anymore, where there is not up or down, no left or right, and everything is possible. Following this idea in the Alter store the stair become an independent element capable to wrap the space or to fold like a peace of paper creating impossible environments… or maybe possible, in the Alter dream. Ok, it's official, the Alter. blog is finally up and running. We will be bringing you all the hottest news, gossip, secrets, lies, facts, fiction, stories and rumors. And that's not all, we will be posting great photos and videos, giving you the best styling suggestions, telling you what's in, what's out and what's HOT! Follow us on our buying trips to international cities, come party with us as at all the best bars and clubs in Shanghai and read our interviews with the top designers, artists, musicians, bloggers and icons. Join us on our adventure as the Fashion Police hunt you down and check out if you’re committing any serious fashion crimes. Yes I know how lucky you are to have this amazing insight into the Alter world!